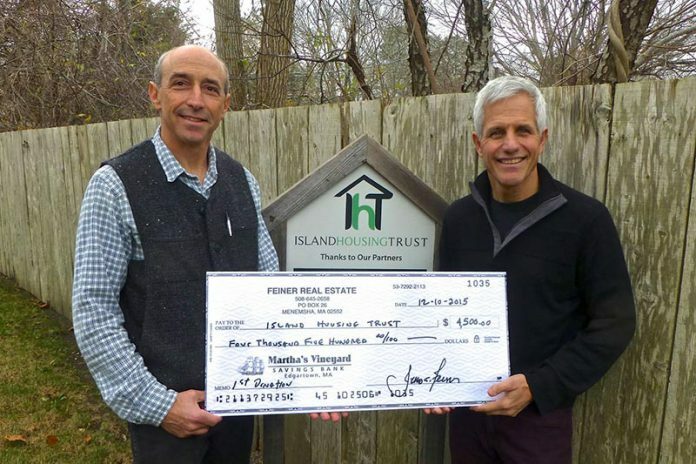 For the past five years, Feiner Real Estate, owned by Jim Feiner, a firm that specializes primarily in up-Island sales and rentals, has donated 1 percent of profits from seasonal rentals to the Island Housing Trust (IHT). He is a member of the IHT board. Now, as summer rental bookings kick into high gear, Mr. Feiner hopes other real estate firms will join in what he calls the Broker’s Initiative, and donate half a percent of profits from their seasonal rental income to help create housing — primarily year-round rentals — on Martha’s Vineyard. Mr. Feiner said the 1 percent annual donations from his company have totaled roughly $1,500 each of the past five years. Brokers Initiative does not completely describe Mr. Feiner’s idea, because he is also looking to enlist private homeowners to donate one percent of their rental incomes, and to give seasonal renters the opportunity to contribute.